The probability of a unified ruling party in Tamil Nadu has shrunk with one of the two main camps indicating it's run out of patience with the negotiations that began two weeks ago. O Panneerselvam or "OPS", the former Chief Minister of the state, will on Friday begin touring the state to build support ahead of crucial local body elections due by July. The announcement of his travel is a warning sign to the competing faction, headed by current Chief Minister, E Palaniswami or "EPS", that he's ready to call time on the hunt for a truce. The ungluing of the AIADMK was the result of the death in December of its ultra-powerful and charismatic leader, J Jayalalithaa. Despite a lengthy hospital stay during which few people saw her and skimpy information was released on her condition, she remained Chief Minister till she died. After that, OPS took over in keeping with a long tradition of serving as her stand-in. Ms Jayalalithaa's live-in aide, VK Sasikala, took over the party but then erred by making a play to become Chief Minister herself. 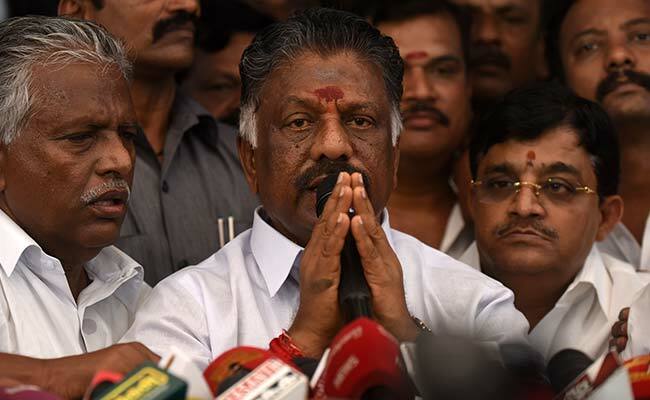 The misstep saw OPS revolting and launching his own team; at the same time, the Supreme Court sentenced Ms Sasikala to jail for a decades-old corruption case that also involved Ms Jayalalithaa. Ms Sasikala then installed EPS as Chief Minister and tasked her nephew, TTV Dinakaran, with running the party while she did time. Mr Dinakaran in two months delivered the equivalent of a multi-car pile-up through a robust lot of corruption charges, one of which led to his arrest late last month. Being accused of swindles has been a mainstay of Ms Sasikala's family which has led to its christening as the "Mannargudi Mafia" after its village. Dealing with the ignominy of his cases, EPS quickly agreed to OPS' demand to terminate any prominence of either Ms Sasikala or her nephew. But he has refused to formally sack them from the party, and has also not sought a CBI inquiry to determine how Ms Jayalalithaa died. Unless those two conditions are met, OPS has said, all bets are off - his faction has also indicated it could call for the dissolution of a committee that has members of both sides leading the talks for a reunion. Team OPS has alleged that Ms Jayalalithaa's death was not natural, and that Ms Sasikala's actions in hospital merit close scrutiny. OPS says EPS' commitment to marginalising Ms Sasikala and her nephew cannot be taken at face value. Both sides have filed competing claims for the party symbol of two leaves. Ms Sasikala's name remains on the documents filed by his competition, and this indicates she could engineer a comeback as power centre, he says.